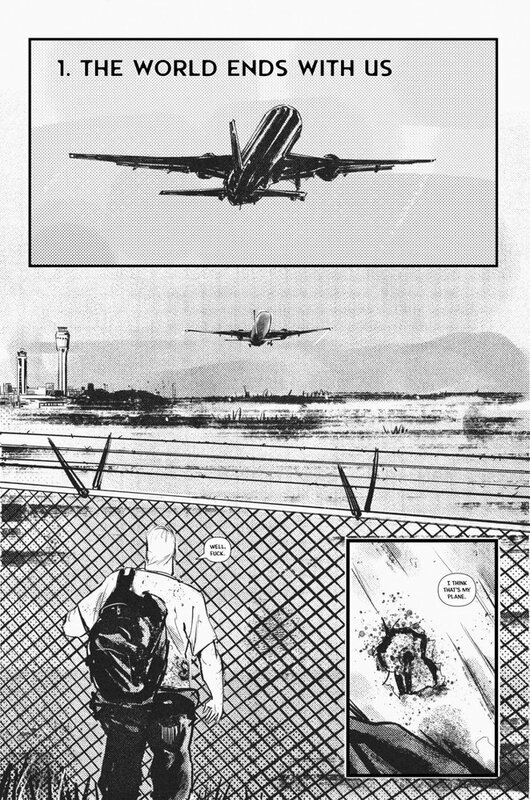 1) What are your own origins, Jed McPherson, and how did you meet up with your artist on this project, Chris Shehan? Jed McPherson: Originally I wanted to be a journalist and I signed up for a postgrad in magazine journalism, but I got halfway through the course and discovered that I hated it. It got so bad that I just kinda stopped turning up for class. With all my friends either in full time education or actually working for a living, I had a lot of time on my hands. So, I decided to write something for myself. Something fun, you know? 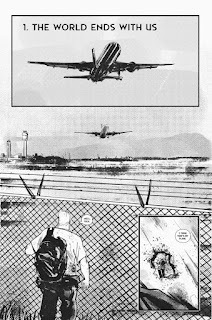 At the time I was reading a lot of Vertigo stuff -- Transmetropolitan, Preacher, and Y the Last Man -- you know, the classics, and I wanted to do something similar. A week later I had the first six issues of what was going to be a sixty issue masterpiece. Looking back at those scripts now and they’re absolute garbage but you’ve gotta start somewhere. Then I sorta bummed around for a bit, writing scripts and trying to con artists into drawing something, but I never really got anywhere. It eventually hit a point where I either had to quit or really make a go of it. So I saved up some cash and started hiring artists. Chris was one of those artists. 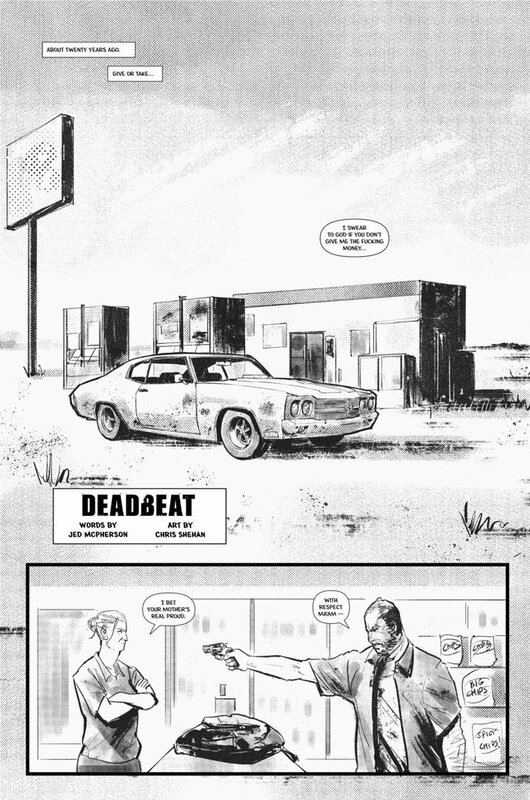 2) What inspired you to create, ‘Deadbeat’? JM: Would it be weird if I said Chris? Obviously I’m not saying he’s a deadbeat, as I’ve seen his schedule and it’s insane, but we’d worked together before on a short for my webcomic, Jacob, and I knew I wanted to do another comic with him. So I sent an email asking if he could draw any book what would it be, and Chris said either noir or horror. I’m a huge Elmore Leonard fan so of course I went for crime. I sequestered myself away in my room with a six pack of Camden Pale and a notebook and got plotting. I think the first idea I had was the shot of Laurie as a baby in the back seat of Mikey’s getaway car. I don’t remember where the image came from, but once I had it, it was just a question of working my way back from there. 3) How would you describe this story? JM: I’m not great at elevator pitches but I always describe Deadbeat as a neo-noir thriller about a deadbeat dad that tries to reconnect with his estranged daughter through armed robbery. 4) How would you describe your style of art, Chris, and who was the first person to inspire you to draw? 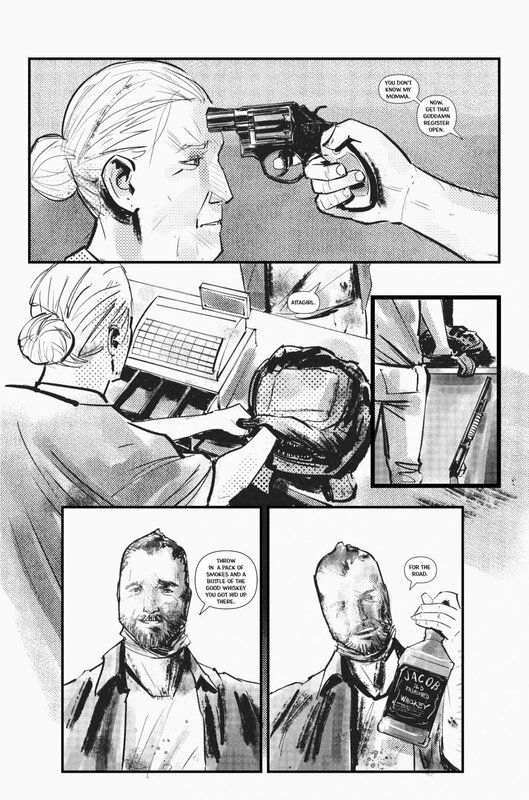 Chris Shehan: My art style has been referred to with words like gritty, dark, and noir. So I guess I'd agree. I didn't always draw this way, but I found this to be the best way I can express myself. I've been drawing since I was 4 or 5, before I even knew what inspired me. But my earliest memory of drawing was a Batman face, and I watched A LOT of Batman: The Animated Series at that age and on, so I'd say Bruce Timm was the first person to inspire me to draw, without me knowing who that was. 5) What song would you say best represents this comic and why? 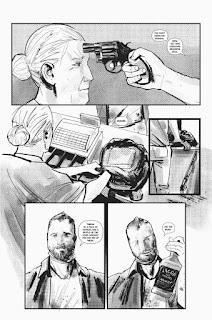 CS: "Hurt" by Johnny Cash popped up in my head a lot while drawing it as well as reading the script. The grit and pain of the story goes great with that song as a soundtrack. 6) If you could get a celebrity – either living or dead – to promote your wares, who would you choose, and why would you want to choose this particular person? JM: Oh man, that’s a weird question. I don’t know, maybe Dusty Rhodes? I mean, there’s a man that knows the kind of Hard Times a guy like Mikey goes through, and I’d love to have him cut a promo on me. 7) What have you learnt about yourself through this endeavour? JM: That I love writing one-shots. There’s just something about the challenge of fitting an entire story into 20 pages that I really like. Trying to get your reader to care about these characters in such a short amount of time isn’t easy but it sure as hell is fun. CS: I love the challenge of drawing real, raw human moments. Really giving my characters a chance to "act" rather than just looking cool, or in an action pose. Subtle expressions that make us feel. Not sure if I pulled it off, but I've found it's my favorite thing to draw and I love the challenge. 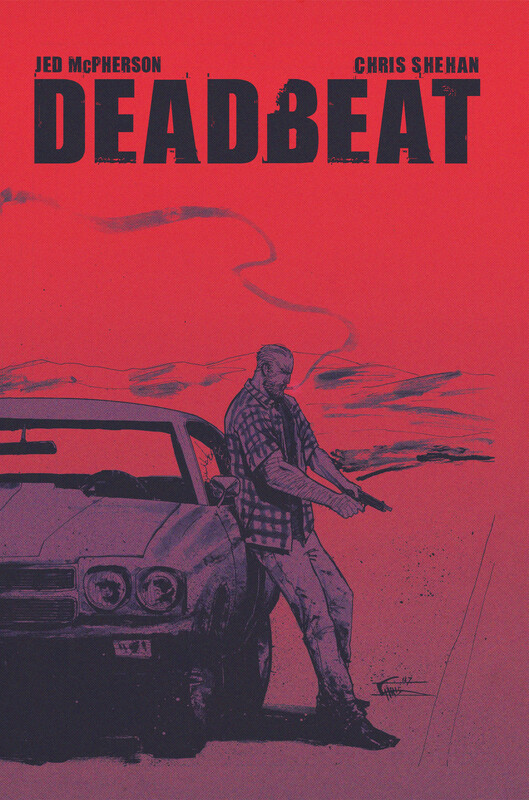 8) If ‘Deadbeat’ had a motto, what would it be? CS: Every action can have a residual and exponential consequence. 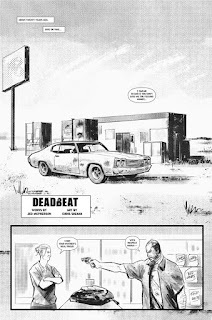 And on that note, I'd like to thank Jed and Chris for telling us about their new comic book, Deadbeat, before directing you towards their website and twitter pages. And while your at it, don't forget to pick up a copy via gumroad (for UK customers) or bigcartel (for US customers).